Where do Queensland’s super rich live? Queensland’s super rich are most prevalent in the Ascot-Hamilton and Kenmore-Brookfield areas in Brisbane and up and down the Gold Coast, if registration data by postcode for super luxury cars – Rolls Royce, Bentley, Ferrari and Lamborghini – are a reliable indicator (see maps below and my post from Sunday for details of the newly released car registration data). Not many super rich appear to live on the Sunshine Coast on in Cairns and Townsville, or if they do they don’t tend to flaunt their wealth (see maps below the fold). There is a lot of detail on the maps and, if you’d like a close look at them, please open them in another window so they fill the whole screen. 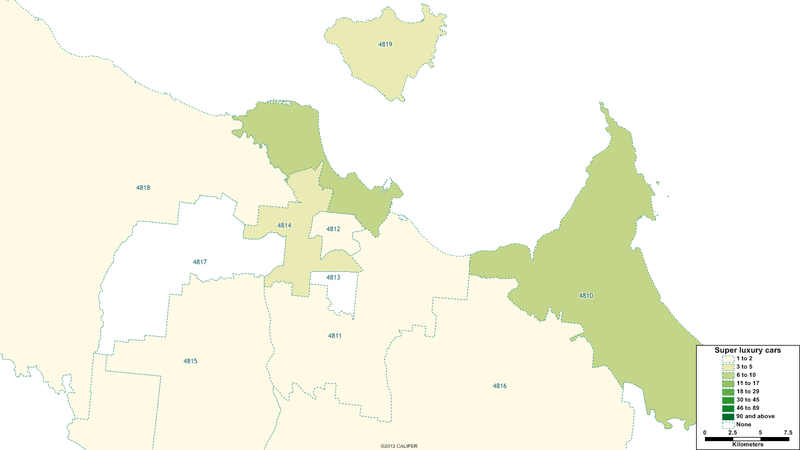 On the maps, the darker the green shading, the more super luxury cars are in that postcode. This entry was posted in Brisbane, Cairns, Gold Coast, Townsville, Transport and tagged bentley, brisbane, cairns, carregistrations, ferrari, goldcoast, lamborghini, luxurycars, queensland, rollsroyce, sunshinecoast, superrich, townsville. Bookmark the permalink.